The AIR Division was well represented at the American College of Rheumatology’s National Meeting in Chicago, IL October 19-24, 2018. This meeting highlights the most current research findings as they relate to Rheumatology. Ten faculty members and one fellow had a total of 16 presentations which included poster and oral abstract presentations as well as lectures. Two presenters, R. John Looney, MD and Hung Trinh, MD were selected as having the best abstract or session. At the 2018 National Meeting of the American College of Rheumatology, Christopher Ritchlin, MD, MPH was honored with one of the College’s highest honors. He was the recipient of its Master of the ACR designation. Recipients must "have made outstanding contributions to the field of rheumatology through scholarly achievement and/or service to their patients, students, and the rheumatology profession (and) devoted their long careers to furthering rheumatology research and improving clinical standards in the treatment of rheumatic diseases." 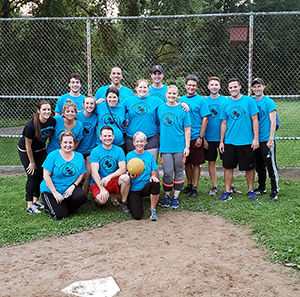 Several of our multi-talented staff competed in the University of Rochester Kickball league under the team name, Aller'Gs. While being stars in the office by day, the Aller'Gs took first place for the season in their division on the field endeavor. Congratulations, Team! Jennifer Barnas, MD, PhD was recently awarded an ACR Research Foundation award to support her investigation into “The Contribution of Renal Epithelial Cells to Innate Interferon Pathways in Lupus Nephritis.” She was also chosen as one of sixteen researchers to attend the Master Class in the SLE Basic and Clinical Sciences next month. Ms. Heelon, a physician support specialist in AIR, recently discussed the frustrations patients and staff experience with delayed prior authorizations and step therapy at the RNS National Conference in Fort Worth, TX. She offered practical advice for providers to help avoid delays. Allen Anandarajah, MD, MSc and Bethany Marston, MD have each been chosen to sit on a National Committee of the American College of Rheumatology (ACR). Dr. Anandarajah is now a member of the Committee on Rheumatologic Care while Dr. Marston joins the Committee on Training and Workforce. The IQ-LUPUS (Improve Quality in Low-income, Underserved, Poor, Underprivileged, SLE patients) Project, funded by the Greater Rochester Health Foundation, aims to overcome some of the common problems faced by SLE patients from the minority communities. As part of this initiative we aim to educate the healthcare providers caring for patients with SLE. This CME conference is the first of such meetings and will discuss healthcare disparities and how they impact the care of lupus patients. The conference will be held Saturday, June 9th from 8:30 am to 4:00 pm. For more information and to register visit www.cvent.com/d/2gq9tn. Dr. Allen Anandarajah and Ms. Ostronic join one of several dozen UR Pursuing Excellence teams at URMC who will be fostering collaborative interprofessional teams to improve the quality of care for patients. This is part of a Medical Center-wide initiative to provide improved, innovative medical care throughout the URMC medical system, not just in the hospital. Drs. Ummara Shah and Jeanne Lomas have recently taken on the role of Associate Program Director for the Rheumatology Fellowship and Allergy/Immunology Fellowship Programs respectively. The Division has numerous fellowship opportunities including combined training in Allergy, Immunology and Rheumatology as well as adult and pediatric Rheumatology. Drs. Shah and Lomas will bring their unique expertise to these training programs.